Like many of its Southeast Asian counterparts, Singapore has a complicated cultural heritage, one that is a conglomeration of racial, religious, regional and global influences. Art Radar presents the research of three artists contributing to enrich Singapore’s arts and culture scene. Over the years, Singapore has taken great pains to develop its art scene and consolidate its complex cultural landscape. The opening of National Gallery Singapore in 2015 marked the nation’s continued investment in the study and promotion of the region’s modern artistic history. Last year, the Singapore Art Museum hosted the fifth edition of the Singapore Biennale, which showcased contemporary artists from Southeast, East and South Asia. Institutions such as the Institute of Contemporary Arts, LASALLE College and NTU Centre for Contemporary Art (NTU CCA) have also provided opportunities for contemporary artists to showcase their works. These efforts have supported a burgeoning art industry that grapples with a rapidly changing Singapore, Southeast Asia and the world at large. This article highlights three Singaporean artists whose work captures the daily experiences of being in Singapore and perceiving the world beyond it. Weixin Chong considers her artistic practice as nomadic. Exhibiting in and travelling to a variety of places including London, Paris, Seoul and Singapore, this young artist explores the intricacies of human relationships through material metaphors. Chong creates art that responds to the environment she inhabits while being keenly aware of her own perceptions. In Sous-vide/ 真空, Chong collaborated with artist Pauline Cambrai Emond to collect and display discarded clothes found on the streets of Belgium. The work was a response to the 2015 terrorist attacks in Paris. The collaborationwas followed by Chong’s series “Under dress“, which was first shown at BAU 13: DRESS CODEX, Italy. “Under Dress” began with 150 drawings of undergarments and lingerie, and is an ongoing project. The sensuous subject matter is accentuated through Chong’s delicate graphite drawings on gossamer black tissue paper. Her detailed renderings of the contours of each garment leave no surface of that intimate fabric unobserved, untouched. She labels – in careless, cursive lettering – each drawing: demi-cup, V-back high leg, soft backless. Chong’s transition from exploring states of dress and undress from a global to a personal perspective epitomise her artistic practice of skimming the surface of human desire and power, feeling, with utmost sensitivity, the outlines of things closest to us. 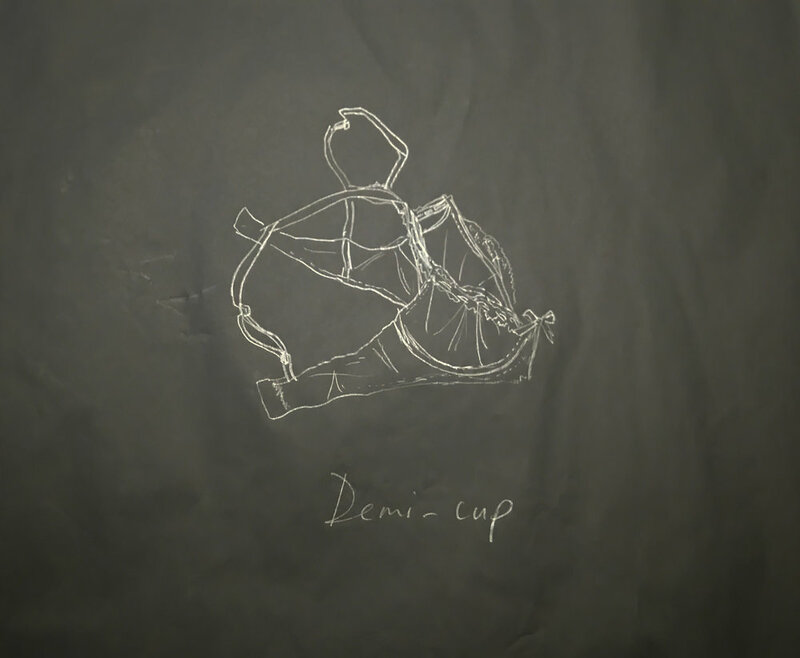 Weixin Chong, ‘Demi-cup’, from “Under dress 0.2” series, 2016, graphite on black tissue paper. Image courtesy of the artist.